Amid the proliferation of digital devices and democratization of information technology, the one aspect that differentiates one product from other is creativity and customer experience. Companies are engaging designers and creatives to deliver enthralling experiences to their audience. Adobe [NASDAQ:ADBE] terms this new trend as ‘experience business.’ Entering as a new fad, experience business is all about identifying each company through the ‘experience’ that they deliver to their customers. “Experiences are transforming industries. 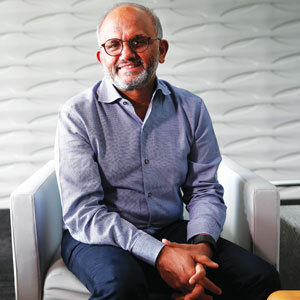 It’s disrupting the way we do business,” says Shantanu Narayen, chairman, president, and CEO of Adobe. From shoppertainment in retail to online streaming of cable TV, experience business defines new ways of connecting and engaging the right audience in today’s digital era. Businesses are trying to make each touch point consistent and continuous—not to mention personalized and secure—to offer a great experience throughout the customer’s journey. However, what makes these experiences unique is the creativity in the way the content is presented to the audience. “We are in the early days of an opportunity that is exponentially greater than previous waves—across hardware, software, and services,” says Narayen. On the cusp of this digital revolution, Adobe is bringing digital creations to life and offering unique experiences to the users. As an ace in the digital media and marketing solutions, Adobe is playing a crucial role in today’s digital world, from creating Hollywood’s superheroes to making compelling ads for the enterprises. Adobe’s journey to revolutionize the digital world began in 1982. While transforming the way computers deal with fonts kept the company busy earlier, they quickly switched to developing creative applications. Be it the premier launch of ‘PostScript’ software or the introduction of stellar products like Photoshop, In Design and Acrobat, the digital media giant has been creating path-breaking products. Adobe strongly believes that ‘creativity is the catalyst for positive change’; driven by this idea, the company has emerged as the trendsetter in the world of graphics, building its reputation as the pioneer in digital imaging and marketing. Adobe has set high standards in digital media and digital marketing as well as publishing and printing through its intuitive products. With proven expertise in providing robust digital platforms, Adobe has empowered numerous enterprises to create, publish and monetize their digital content. The company’s Creative Cloud—which comprises a set of applications and services for graphic design, video editing, web development and photography—is playing a pivotal role in redefining the world of creative professionals who wish to create digital graphics and illustrations for various media channels including print, web, interactive, video and mobile. Creative Cloud offers solutions that suit a variety of requirements, including motion graphics, visual effects, nonlinear editing, and corporate design and advertising. In addition, the company offers ‘Experience Cloud’ that empowers clients with a comprehensive set of cloud services such as Advertising Cloud, Analytics Cloud to deliver exceptional customer experiences. “Experience Cloud is the larger opportunity, and we are excited about it. What makes this even more special is that it comes from interactions with our customers,” says the CEO. As a digital media mastermind, Adobe has championed digital marketing with best of breed solutions for analytics, media optimization, digital experience management, and cross-channel campaign management, and premium video delivery and monetization. Marketers leveraging Adobe’s marketing technology are able to measure, personalize, and optimize marketing campaigns and digital experiences across multiple channels by combining data and digital content to deliver a personalized brand experience to their customers. In tandem with digital marketing, Adobe has also channelized its growth through print and publishing through legacy products and services for technical document publishing, web application development, and high-end printing. The company’s print and publishing segment focus on market opportunities ranging from authoring and publishing needs of modern as well as legacy OEM printing businesses. What unites these diverse segments, consisting of a variety of products, is the Adobe’s strategy to make software that helps anyone turn their idea or story to life. Adobe is relentlessly working on technologies that go beyond the current needs of product teams and empower them to innovate better. The company’s research and advanced development arm, Adobe Research, accomplishes this goal by providing creative experts with a collaborative environment and supporting them with necessary resources to shape their ideas into tangible results that support their business. The research has shaped the direction, and in turn, the future of several key Adobe products. Currently, the company’s research lab is expanding its expertise in the areas of analytics, machine learning, and data mining. These efforts help in fulfilling Adobe’s commitment to provide customers mission-critical digital marketing solutions. It is Adobe’s rich expertise and thorough research that the digital marketing powerhouse is able to get numerous large corporations such as HP, Airbus, Rising Sun Pictures, Princess Cruises accustomed to its solutions. Catering to the needs of a myriad of industry verticals, including education, healthcare, travel, and financial services, Adobe has emerged as the mogul of today’s digital era. The helmsman of the company, Narayen has taken the company to new heights by accomplishing the task of transitioning its product portfolio from a legacy on-premise solution to a ‘software as a service’ model. “When we did it, we were the first company to say we are not going to issue packaged software, we were going to deliver software on the cloud.” Considered to be a dubious move then, it has now proven to be one of the most successful cloud transformations to date where Adobe’s applications can take advantage of cloud-based intelligence to offer up-to-date recommendations and solutions to the users. Having creativity in its DNA, Adobe is working towards creating programs that combine disruptive technologies such as AI and machine learning to power the design and delivery of digital experiences. Adobe believes that in today’s world, winners will be those organizations that can leverage technology as the means to deliver the right message and create engaging experiences for the customers in a consistent manner. By focusing on the evolving needs of the customers, Adobe is poised to deliver engaging digital experiences that redefine customer interaction.